With their simple, accessible materials, the precise, effective flexibility of the painter’s brush, and the efficient, frequently inspired artistry of their creators, Byzantine wall-paintings are a vigorous yet modest expression of the monumental painting of Byzantium, a worthy equivalent of the precious mosaics. Their easily executed, albeit demanding, technique, the immediacy and charm of their style, and the instructive potential of the representations (vehicles of the fervent faith and the doctrines of Orthodoxy), combined with their low cost, were all factors contributing to the widespread dissemination of wall-paintings throughout the entire chronological and geographical extent of the Byzantine Empire and the countries under its religious and cultural influence. In the populous cities and major monastic centres of Byzantium, eloquent, dignified religious paintings inundate the walls of both small, insignificant houses of prayer and renowned churches, adding equal prestige to their donors: important state officials, high-ranking members of the Church hierarchy, and humble believers alike. 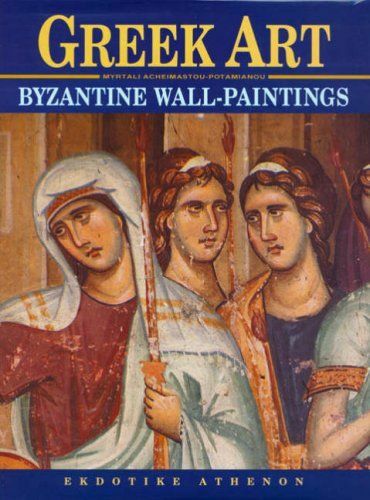 A representative sample of outstanding wall-paintings from forty-one celebrated monuments is presented in the volume ‘Byzantine Wall-Paintings’. This treasury of visual artistic material covers, historically and stylistically, the development of the art of wall-painting from the 7th to the 16th century inclusive, which is fully documented, and discussed with great sensitivity by the author in her introduction to the volume. The particular visual physiognomy and artistic contribution of every ensemble of wall-paintings included in this book can easily be appreciated by the reader with the aid of a full, readily comprehensible discussion of the artistic style and aesthetic value of each of the paintings, together with a brief account of the monument it adorns.